It is the ultimate in comfort food, all the ingredients are sitting nicely waiting for you to cook’em up and when brought all together it’s like little angels singing the perfect hymn in your mouth. 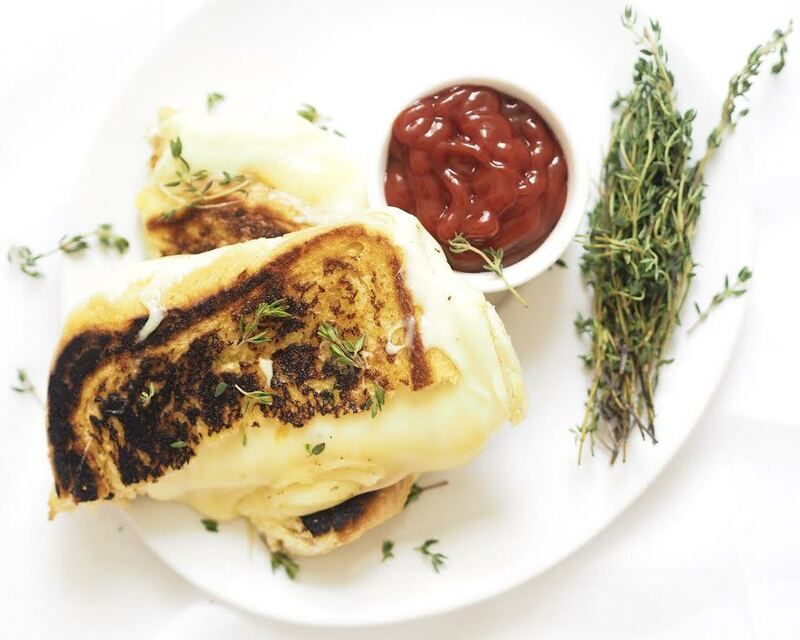 The ultimate cheese sandwich screams comfort, perfect for a weekend brekkie in bed or a little naughty mid-week treat. Hands down you know you can not beat it, it's great and damn sure it can be eaten at any time of the day, I mean cheese a naughty wedge of bread a cheeky bit of butter what’s not to love! 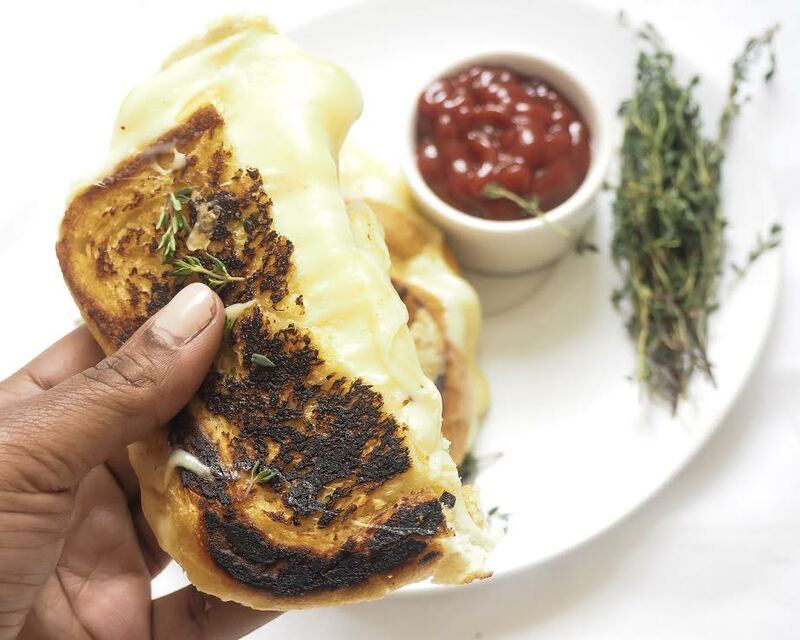 I love cheese, the kids love cheese, you love it, well all freaking love cheese especially melted that bubbly molten golden silky cheeses gouda goo is a thing of wonders and this bad boy is jazzed ups or perfection. 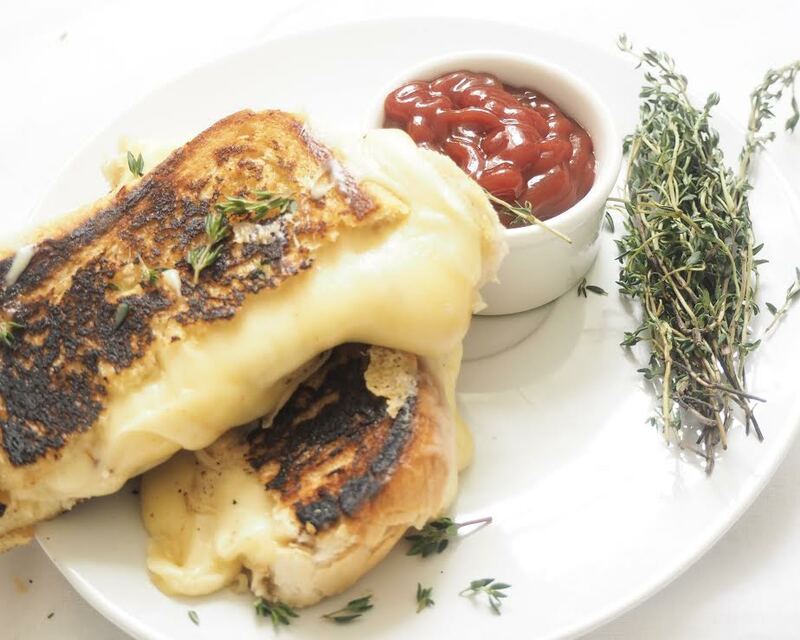 With rain and cold weather about to grab us here on old Blighty and before you ask, no this is not an April fools joke, boy I wish it were, this toasted cheese sandwich is the perfect comfort food. Another one of my favourite comfort foods in my leftover humble chicken pot pie or my cauliflower cheese & pancetta soup, or if looking for something a little lighter but still comforting then you damn well gotta try my kale pesto pasta, after why not curl up on the sofa with a new book with my ultra tasty moon milk. This version of cheese sandwich takes no time to make at all, and it's super versatile, I'll be trying it with a different cheese and maybe knock up super fresh pesto to go with it, but for now I certainly recommend that you guys try this tonight, a great meat-free dish, this would work also wonders as an accompaniment to my gazpacho dish or served with a salad too. 1. In a small pot melt butter, with grated garlic and add a sprig of thyme. 2. whilst butter mixture is melting, heat up a frying pan with a small cube of butter to coat the frying pan. Cut your slices of bread. Once butter has melted brush over bread and then place bread brushed side down. 3. Add on top of the non buttered side of your bread 3 slices of cheese, sprinkle some of your chilli flakes on top, add the last two pieces of cheese on top, then place non brushed side down of your bread and place on top something heavy (tin of beans to press down the bread. 4. After 3/4 minutes turn over your toasted cheese sandwiches and fry on the other side. 5. Serve immediately, works great with a side salad, or if feeling extra naughty a few slices of Proscuitto ham. For more recipes, click here, or follow me on my Pinterest or Bloglovin page! !